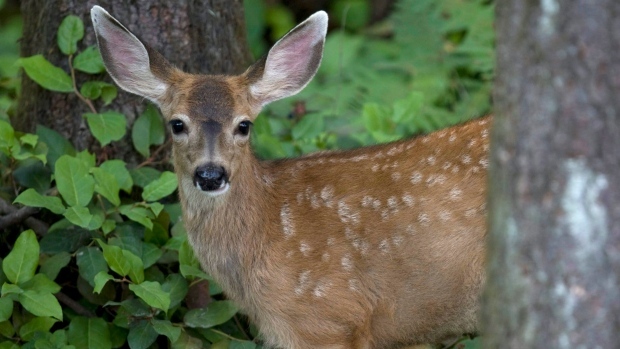 MONTREAL -- Officials in Quebec are banking on a massive cull of the province's deer population to help prevent the spread of a fatal disease after its first-ever case was detected on a game farm north of Montreal. Quebec's Wildlife Department confirmed earlier this month that chronic wasting disease was detected in a farm-raised animal that was sent to slaughter in late August. The disease is a fatal infection of the central nervous system in deer, elk, reindeer and moose, and is similar to mad cow disease in cattle. While it can go undetected for years, the condition eventually causes poor health, behavioural changes, disorientation and death. The recent discovery was the first positive case in more than 22,000 samples that have been tested in the province. The news has raised alarm bells among government officials, who have banned hunting, trapping and off-road activities within a 400-kilometre radius of the farm, which includes parts of the Laurentians and Outaouais regions north and west of Montreal. On Thursday, they announced a plan to cull between 300 and 350 deer in order to test for the disease. A further belt of land has been declared a monitoring zone, where hunters are asked to submit carcasses for testing and avoid taking certain deer parts out of the zone. "The priority is to evaluate if the disease is present in the wild population and, in that case, to prevent its expansion and eliminate it," Wildlife Department biologist Donald Jean told a news conference. Michel Baril, a biologist with Quebec's hunters and anglers federation, said the highly contagious disease has the potential to decimate the wild deer population if it spreads. "If it gets out in the wild population there is no way of controlling it," he said in a phone interview. "We risk losing a good percentage of our deer and moose population." While he believes the Wildlife Department is doing an "adequate job" of testing the wild population, Baril worries not enough is being done to isolate the farm or identify the source of the disease. He believes officials should keep culling animals until the source of the disease is identified. "The only way to know if an animal is sick is to slaughter it and analyze the brain," he said. "We don't know where the disease is coming from, and we don't seem to want to work too hard to find out." Baril also believes all game farms should be forced to build a second fence to create a buffer zone between wild populations and farms, where disease spreads more easily due to crowded conditions. Stephane Lair, a veterinarian who works with the Canadian Wildlife Heath Cooperative, said that while it's true game farms can spread disease and impact wild populations, that's true of every agricultural activity. He said it's possible the captive Quebec animal could have contracted the disease from another animal such as a bird, or even a human who handled contaminated equipment in a place where the disease is present. But most likely, he said, the disease has already been present in the province at low levels for some time. "Just because it's never been detected in Quebec, that doesn't mean it wasn't present," he said. The disease was first detected in the 1960s in the United States and has since become nearly impossible to eradicate once it becomes established in the general population, Lair said. It has since spread to some 25 U.S. states as well as Alberta and Saskatchewan. Quebec's intervention plan is modelled on that of New York, which is believed to be the only state to have successfully eliminated the disease after it was discovered. El Mehdi Haddou, a veterinarian with the Canadian Food Inspection Agency, said he's hopeful the disease was caught early enough to be stopped in Quebec. He said several dozen animals from the affected farm have been tested in recent days and all were clear, including 14 of the same age as the infected animal. "By testing these animals, we know the prevalence of the disease will be ... very low, because the animals that had the most chance to be infected were negative," he said. He added his agency and provincial agriculture departments are still investigating and are open to taking more measures, including culling the entire herd if necessary. While there is currently no evidence the disease can spread to humans, Haddou said scientists haven't ruled out the possibility it could happen. For that reason, he said, hunters are advised not to eat meat from deer that show symptoms of the disease, or to at least have the carcass tested before consuming the meat.